Trees of course have roots to collect water and nutrients for the tree to grow. In the garden, tree roots can become a problem if proper consideration is not given to them when planting trees. Different problems can occur and these often depend on what type of tree you are growing. So when choosing trees and places to plant them, it pays to think about possible future effects of roots on your property, or that of your neighbors. Most tree roots are in the top 12 to 24 inches of soil, with fine feeding-roots close to the surface. As roots grow they become thicker and close to the trunk they can be as thick as the branches on the upper part of the tree. Both the thick roots and the masses of smaller feeding roots can cause problems with pipes and pavements if trees are planted too close to them. How close that is will vary with different types and sizes of trees. Although it is possible for some tree roots to break drainage pipes, the more usual problem is when pipes crack or joints fail with age or ground movement. Tiny roots then penetrate those cracks and joints, and multiply inside until the pipes are completely blocked. This will cause drainage water to back-up and it can lead to slow drainage, flooding and leaks. This is usually more of a problem with older pipes, as modern systems are much less likely to break. The best long-term solution is to replace the pipes, but if this is not possible, mechanical routing is effective, but will need to be repeated regularly. Consider that the long-term costs of routing may be more than the cost of replacing pipes. Chemical products are also available that are put into the sewer, usually as foams. These are often effective, but follow the directions carefully or damage to your system or trees can occur. Trees that grow best in damp conditions, like poplars, silver maple and willows, are the trees that most commonly block pipes. 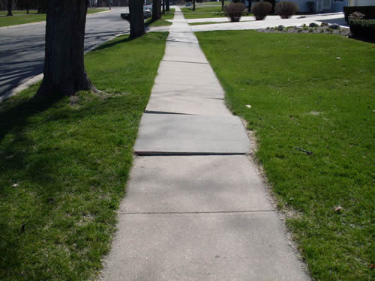 Another place where problems are often seen is with paths and driveways. 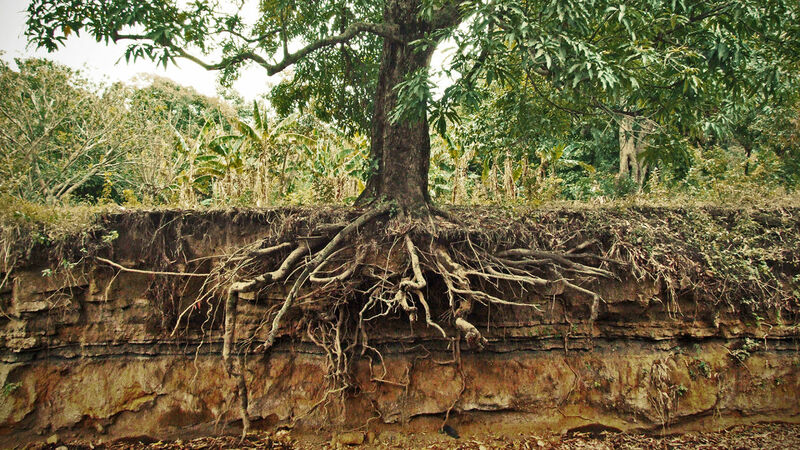 If trees are planted too close, the natural growth of the root system can make the hard surfaces lift and then crack. This is unsightly and if your trees are doing it to your neighbors driveways, it can be costly for you. If you are laying a driveway or path near growing trees, then styrofoam sheets laid under the foundation will allow for expansion without cracking the path. When choosing planting locations, consider the following: trees that will grow to less than 30 feet tall should be 4 feet from the driveway, those ultimately 50 feet tall should be 6 feet away and taller trees should be at least 8 feet away. A possible solution for existing trees is root pruning. Young, healthy and vigorous trees can tolerate significant root pruning, older trees less so. A trench at least three trunk diameters from the outside of the tree can be dug and the roots severed. Make clean cuts on all the roots to encourage rapid healing. A physical barrier of geotextile at least a foot deep buried alongside paths will encourage the roots to go deeper, which is another way to prevent lifting. 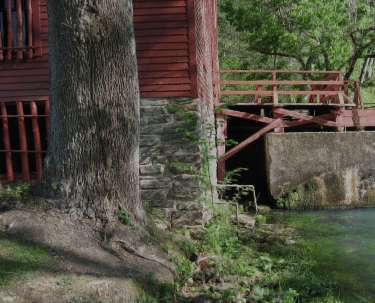 Although trees are often blamed for foundations failing, they are rarely the true cause. Soil subsidence is the normal reason for cracks in foundations, since trees are just not strong enough to damage properly-built foundations. Sometimes trees can draw a lot of moisture from the soil below the foundations, causing it to dry and shrink, which in turn may lead to cracking, but this is not common. If there are disputes between neighbors over root damage, samples of roots can be analyzed by botanists and the species of tree determined, so that the correct tree is blamed for the damage. This is obviously important, since it may be your own tree causing the problem, not your neighbor’s tree. The other side of this coin is carrying out construction without damaging existing valuable trees. Careless digging can damage roots and lead to disease, decline and ultimate death of trees. Since trees only have about six major roots, severing one or two of these close to the trunk has a serious impact. It can take years of care to restore the health of a tree damaged by construction. When laying utilities, tunneling or augering under the root system is much better than digging trenches that sever major roots. Changes in grade are another common issue with construction. For some trees even a few inches of soil added or removed can cause major changes. Designing around important trees is the best solution, or creating tree-pits is often effective too. These need to be large enough to expose a good area of soil as well as avoid burying the trunk of the tree. Sometimes in the long run it is better to be cruel and just remove an endangered tree, replanting a new specimen after the work is done. Struggling to preserve a damaged tree can be expensive and ultimately futile, while a new tree will give pleasure for decades or even centuries to come. I have a black oak tree that is probably 60 years old sitting right over my sewer pipe that must be replaced (an Orangeburg pipe that has outlived its life). The sewer line and water line are close together. My contractor plans to trench around the trunk (5 feet away) because he can’t go under the tree. I have done a lot of research, and survival of my tree doesn’t look good. Air spading is $175/hour, and then I have to hire their excavator (more than the $4000 my contractor is charging me). I am sick with worry. The sewer pipe is 5 feet 1 inch down. I NEED ADVICE!!! If the trenching is only on one side, that leaves over 50% of the root zone untouched. Make sure the roots over an inch or two thick are cut by hand and sawed or lopped to make clean ends – not ripped out with a back-hoe and left torn and jagged. Have the top 2 feet of the trench filled with good soil containing plenty of organic material, like rotted manure, compost or if nothing else, peat moss. Most soil suppliers sell a ‘planting bed mix’ which would be ideal to use. Keep the tree well watered for a couple of years, with long, deep soaking every week or two, not little sprinkles every day or two. Oak are not susceptible to diseases spread through the roots, as Maples, for example are, so your tree should be fine if you do these things. You might also consider having a contractor come in and do deep root feeding with a pressure tank and probe, right after the work is completed, and again in the following spring. If the work can be done when the tree is leafless, that would be best, with the root feeding in early spring before the leaves come out. If after two or three years of growth there are some dead branches, have a tree surgeon take them out, but don’t assume a sickly branch is dead until it has no leaves for a whole growing season. I write for this website, and I am a trained horticulturist, so you can take my advice. Use a trench less method. Burst your existing sewer pipe and pull another pipe in the same footprint. This is a mush faster and cheaper method than trenching. Also this will not harm your tree. If you use polyethylene pipe you will not have any joints for future roots to penetrate. Trenchless, faster, cleaner, safer. Notice my email address, I have been in the underground utility business for 40 years.